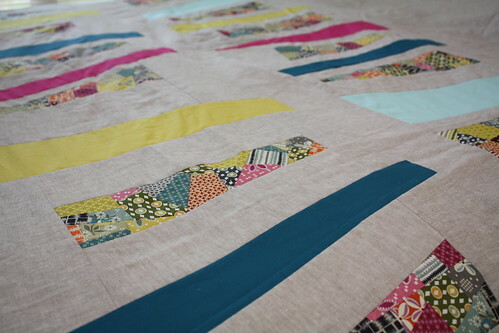 As I carried the two halves that I have going so far for my epic Anna Maria Horner patchwork quilt up the stairs to my bedroom to take some progress photos yesterday afternoon, I realized that apparently I only make warm/cool quilts of my bed. My other bed quilt, made some eons ago, is a warm/cool HST quilt, and this new quilt is a simple charm quilt set on point and sorted into warms and cools. I had myself a good chuckle over it for a few minutes before setting about to laying out my work so far on the sheet to see how things were looking, now that my progress doesn't fit on my design wall. That's the thing about making big quilts for me - it's hard to really get a good sense of how they're looking in my sewing room right now with the way things are laid out. I really need a full wall of design wall. That would be superb. But that would mean giving up a lot of storage space, which isn't really doable with the current state of my stash, so unless I downsize my stash massively, this method of laying things out sometimes in my bed will just have to do. Make it work, as Tim Gunn says, and he says it so enthusiastically and convincingly that he's got me believing. I'm really, really, really excited about how things are looking so far. Super excited. Wish I could sew, sew, sew and finish the whole thing off today excited. But life rules, and there are kids to care for, and QuiltCon to work on, and dogs to walk, and real life waits for no one. But come next weekend, here's hoping there's at least another row or two added onto this bad boy. I think there's ten more to go total to get it large enough to have enough size to be able to tug back and forth between me and my husband and for it to hang down to where I want it to hang to. Ten more. I can do that. Eventually. Here's hoping you all had a great stitchy weekend too! And I know I have more diamonds to make, I'm just not sure how many exactly...at least one more big cool diamond and one more big warm diamond, but likely more than that, to make a quilt big enough for our bed. I think I'll likely employ an alternate grid of some kind to make the blocks float and have a more varied, interesting layout, but I haven't quite gotten that far yet. Baby songs are all up in my head these days. While Lorelei is still quite little to appreciate songs and stories, I still spend time with her each day singing those familiar tunes and reading a story or two. Her smiles are becoming more frequent, which makes the days where the crying stretches on for what feels like eons a bit more bearable. 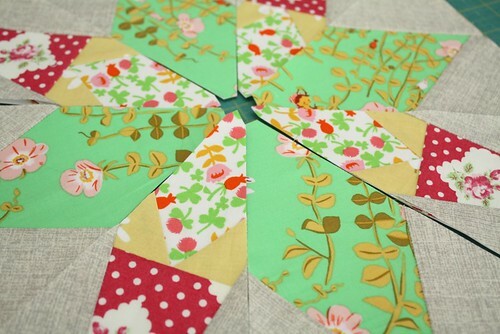 And playing with my scraps this weekend also helps soothe this tired mom. I've been wanting to make a new quilt for our bed for probably two years now, and after many different ideas that just didn't quite feel perfect, I think I've stumbled on one that is. 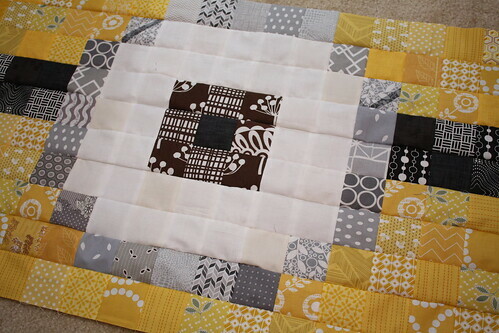 These simple little patchwork blocks, sorted into warms and cools. They're crazy easy to stitch up, super fast, and let me play with all the little bits and bobs of leftover fabrics in my scrap bin. Perfect for naptime sewing. How is it that Monday creeps up so quickly these days? And how is it possible that there's less than month left of my munchkin's kindergarten school year? 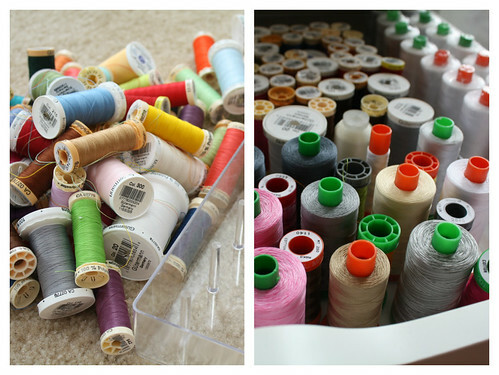 The days are flying by around here, and that's certainly in part to a good bit of secret sewing going on in my neck of the woods, and I'm sure the other part contributing to the fast pace of time is just life. It's amazing to me that it's already May, it feels like it was January just five minutes ago! In any case, this past weekend was a good one, filled with some quality time with the kiddo and a fair bit of sewing as well, in spite of the horse fly that invaded my sewing room Friday night. Thankfully I was able to shoo the fly (no quilty pun intended!) and get some nice sewing done in peace. 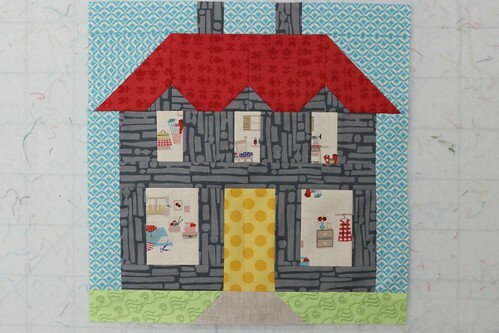 This little house block is heading off to Quiltmaker headquarters for a fun project they're putting together, and you can find the pattern in Volume 8 of their 100 Blocks series, block #783 designed by Lori Holt. I even managed to do a little bit of selfish sewing this weekend, which was so nice. 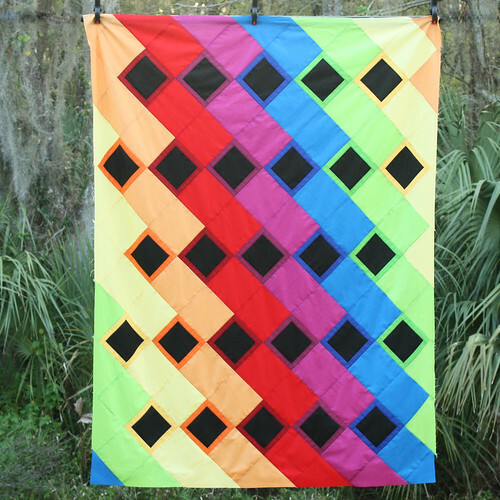 I started on this quilt back at The Stash Bash - I had decided before I left that the time had come for me to make a KJR (Katie Jump Rope) quilt. Making the first cut was a teeny bit painful, but it felt good to finally start using something I had loved and hoarded for so long. I decided that a simple block would be best, so I could have large chunks of the prints I love so much, and so that's how I wound up with this work in progress. 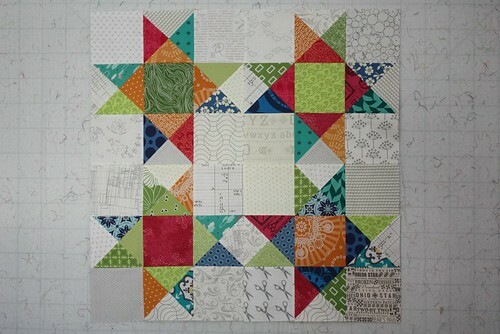 I think I've made somewhere around 50-something blocks now, so I think I'll wrap it up and sew them together this week. For now, it's fun to play around with the layout. 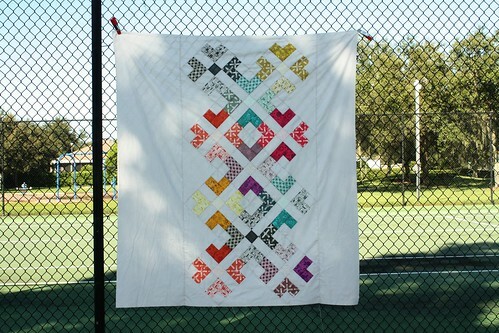 Once upon a time, there was a super fun swap called Sew Sew Modern. I watched from the sidelines for the first two rounds, and jumped in on the third round, and had a lot of fun. I made something I really loved, received something fantastic that I adore, and promptly signed up for the fourth round when sign-ups opened. Then, I got crazy busy, and lost track of the swap deadline. Fast forward to last week, and I realized I need to get the lead out and get my items made for my partner! The good news is that my secret partner has very specific taste, so it was easy to think up something that I think she'll enjoy. For once, I feel pretty confident that she's going to like what I'm making, which is a refreshingly wonderful feeling in a swap! The next-best news is that I'm having fun making her items so far, and moving right along and should finish just in the nick of time. 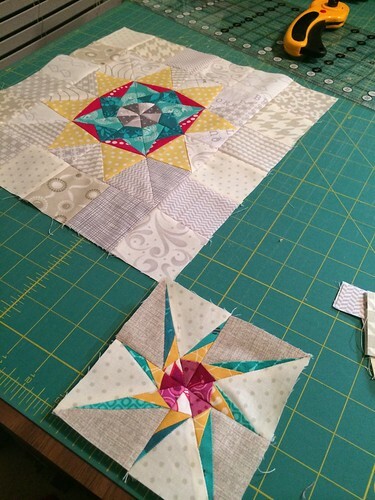 So far, I'm working on a pillow top with a medallion design, using some Lucky Stars blocks from 2013 (the bonus block and the December block), in miniature form, in a color palette completely and utterly inspired by the movie Frozen. Ha! My sewing time has been limited to the darkness lately, so I've mostly shared the progress of this pillow top on Instagram so far, but I managed to get a few decent pictures in the daylight yesterday in between the mountains of work I've got this week. This is going to be a hard pillow cover to give away, but I always love that feeling of giving away something that you truly love and are proud of having made, so I suppose that means that this is going to be another successful round of Sew Sew Modern for me. 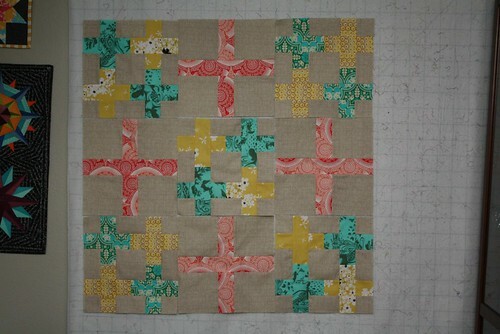 Next up is another border and then some quilting, and then a simple back, so I'm in the home stretch, I think! Stay tuned for a finish on this one real soon, I hope. Have a wonderful Wednesday! Just a quick little note this morning to share a block I made recently from the fabulous new book, Vintage Quilt Revival , by three super-talented ladies I'm happy to call my friends: Katie Blakesley of Swim Bike Quilt, Lee Heinrich of Freshly Pieced and Faith Jones of Fresh Lemons Quilts. If you haven't picked it up yet, I strongly suggest you do, because you'll get sound design advice, beautiful photography, and gorgeous patterns. You won't regret it! 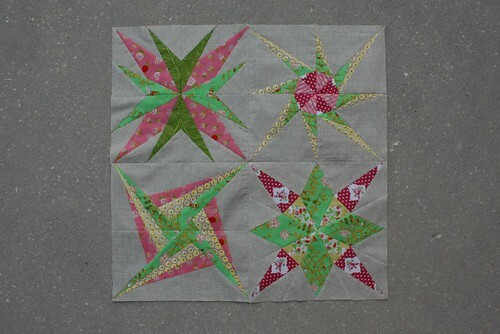 This block is the Exploding Star pattern, which you'll find on page 106 of the book. I almost always use super bright colors in my blocks, so I wanted to try a different kind of color scheme for me, so I went with some really beautiful soft blues from Sweetwater's Noteworthy Collection paired with a bold gray Dear Stella print and my ever trusty Kona Snow. 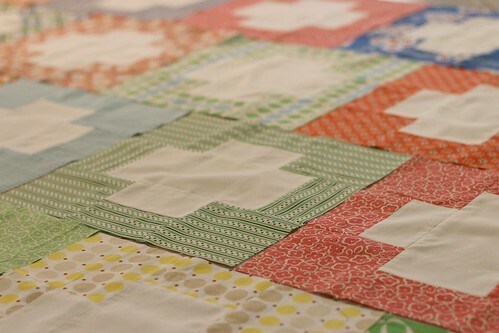 This block, and many others made by several other uber-talented quilty peeps, will be compiled together into sampler quilts for charity by Katie, Lee and Faith later this month. Stay tuned for more info on those, I can't wait to see how they come together! 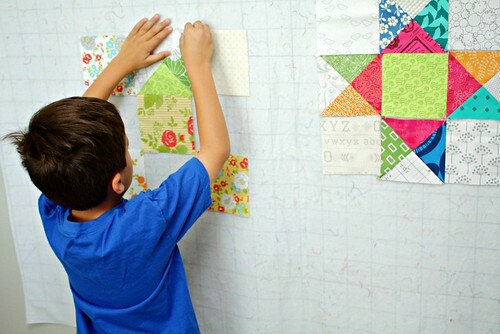 Less is More Quilt, Sun Prints Style - and a giveaway! If you haven't yet heard about Alison Glass's epic Sun Prints collection, chock full of stash must-haves in rainbow colors, prepare your wallet right now, because this is a must-have collection! Alison is a supremely talented fabric designer, whose first collection Lucky Penny featured the wonderful Bike Path print that I used in my Sew Positive quilt last year. Fast forward to this year, and Alison is in the process of releasing her Sun Prints collection, print by print, in multiple colors each month. So far, there's been the Feathers print, the Party Streamer, the amazing Text print, and there's still several more prints coming! Alison sent me a sampling of all of the prints to put together a quilt with, and it was so much fun working with this collection. 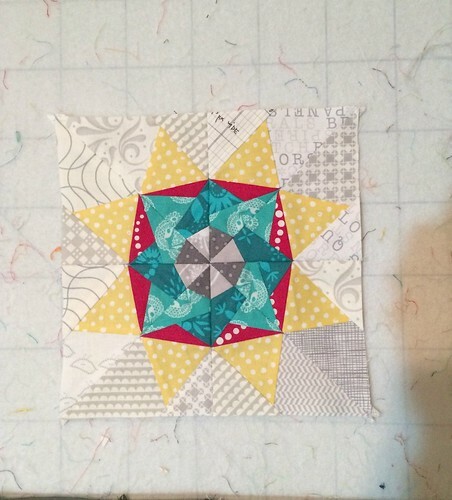 I turned to my book, Becoming a Confident Quilter, for a pattern that would work well for an assortment of fabrics, and I chose to make my Less is More pattern. It's one of my favorites in the book, and it comes together very quickly. 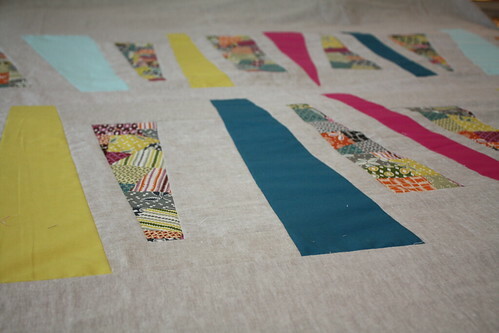 I sorted my fabrics by color, and then got to work, chopping them up. As I sewed, I had a good feeling about this quilt top. 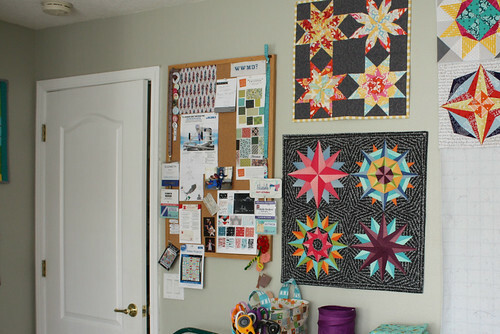 I had a feeling I was going to love it, and as I placed the blocks up on my design wall, I couldn't help but grin. The blocks were fantastic. The prints shined through the piecing really beautifully, and the rich, saturated colors popped from my background fabric, which is a new shade of Kona called Silver, which I am loving right now! And if you are salivating over these fabrics, then you need to make sure scroll to the bottom of this post to enter a giveaway to win a stack of 10 Sun Prints fat quarters and a copy of her new Color Plus pattern! One lucky winner will be drawn on Monday morning. And that's not all! You simply must go visit Alison's blog to enter the amazing giveaway she's running right now. She's giving away a fat quarter stack of all 74 Sun Prints! There's been a great group of bloggers that have been sharing their creations with Sun Prints, and still a few more left to go, so make sure to check them out! It's been a rainy start to the week in my neck of the woods. A soaker, really. Thankfully, it's nothing tropical, but steady, all-day rain is very un-Florida. Nothing but gray skies and the drip-drip-drip of raindrops, so it's been a sluggish start to the week for me. I need a good cup of coffee to get my juices flowing and get my week chugging along! I had such a great time over the weekend at my trunk show in Sarasota. 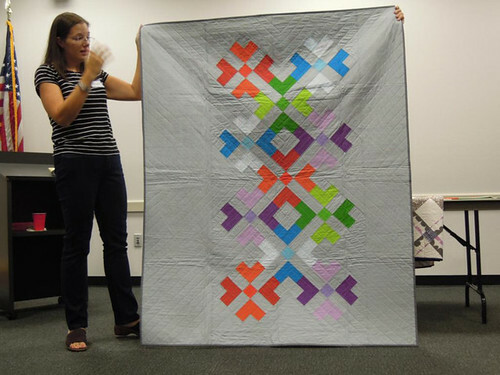 Thank you so much for having me, Sarasota Modern Quilt Guild! 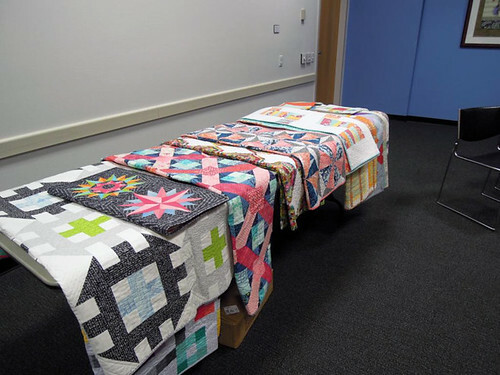 It was a lot of fun to talk through a bunch of my quilts and share them with other sewists. 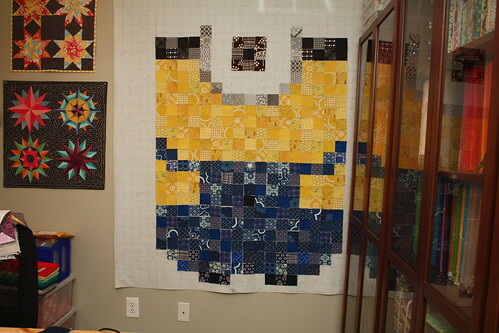 In my sewing room, I'm making good progress on my little minion quilt - I've got the bulk of the patchwork for the center sewn together now, just need to start adding the outer white borders, then the pixelated border. If only I could decide on what color(s) to use for the pixelated border. :) I did manage to cut up all the white squares, just need to start sewing them together. I think that's in the forecast for today, after I venture out to the grocery store in today's rain. Here's hoping I don't manage to get stuck in a downpour! 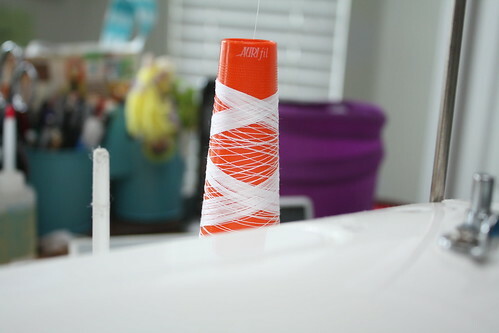 And I absolutely must remember to put a new cone of Aurifil on the machine today, too! I think I've got mere inches left to spare. Have a great Tuesday! My weekend consisted of loads of errands and chores, but I carved out a bit of sewing time for myself, too. I managed to finally cut into the towering stack of fabric I pulled together for my munchkin's minion quilt. 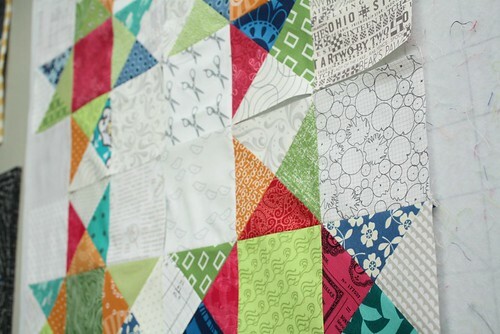 A zillion and twelve 2.5" squares later, I started playing around with the layout on my design wall, and I'm in love. This project is so much fun to work on. I found myself wanting to do a little happy dance when it suddenly stopped looking like a bunch of squares and started looking like a minion. Quilt Market is coming up again in just over a month, and I'm going to be doing a schoolhouse and book signing during my stay in Houston. Eek! I'm both excited and frightened by the prospect of this. First off, can I actually talk for 30 minutes coherently about my book? I hope so. I need to write myself some talking points to keep me from veering off-topic and spending 22 minutes talking about my love for Denyse Schmidt's fabrics or something related and oh-so-not-related all at the same time. Secondly, I'm going to need to work on practicing my signature. Seriously! I have the signature of a seventeen year old boy who's going to grow up to be a doctor - sloppy, mostly illegible and not at all what you would call pretty. 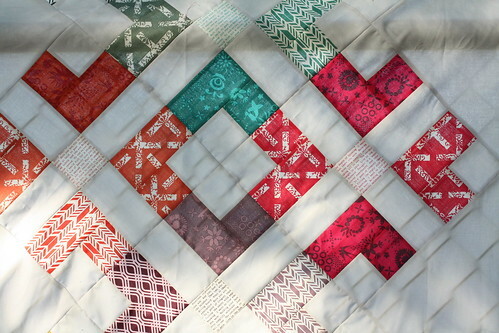 Now thirdly, I have something to finish preparing that's way more fun for Market, and pretty, too - a mini-quilt that I plan to give away to one lucky attendee of my schoolhouse! 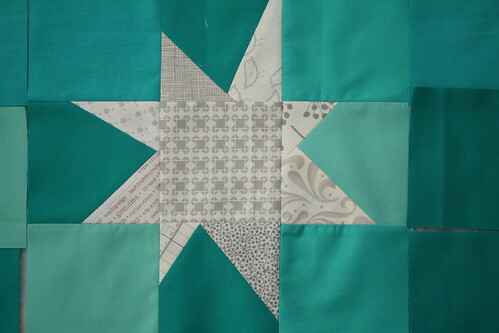 I had a terrible time trying to decide which quilt I wanted to do in a mini, and after a ton of deliberation, I decided I wanted to do Polaris, a really fun, scrappy Ohio star quilt that focuses on teaching sewing quarter-square triangle units and making them as easy as possible. For my mini, I made four blocks, so it came together quite quickly over the weekend. I started with a color palette that I was really digging, pulled some scraps and fat quarters based on it, and got to pressing and cutting. It felt good to just have some fun with fabric and some good tunes. The best part was that I had good company while I was digging through my scraps - my munchkin loves to play in my scrap bins, and put random combinations up on my design wall. Yesterday he actually wanted to mimic what I was piecing, which was fun. He kept asking me to cut more triangles for him so he could create new patterns. I loved the way he kept trying to sing along with the songs on my playlist, that was adorable. I'm definitely planning to sew up some more minis, pillows, and quilts from my book soon, and I cannot believe that it starts shipping tomorrow. I'm hoping to get my first box of books soon so I can fulfill the pre-orders that many of you placed at my Pattern Shop. If you still want to pre-order a copy, you can do so right here or at Amazon - or you can pick up the latest issue of Quilt Sampler and take the $10 Martingale rebate form found inside on page 121 to your local quilt shop to pick up my book and get a great deal at the same time! 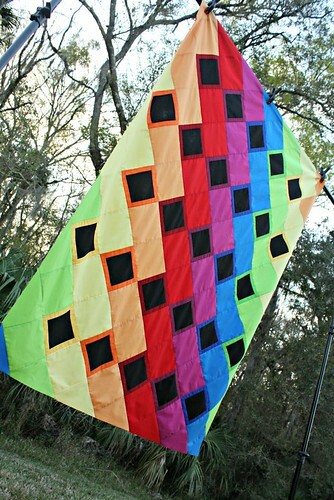 I've been waffling about what to sew up for my partner in the Sew Sew Modern swap for the last few weeks. 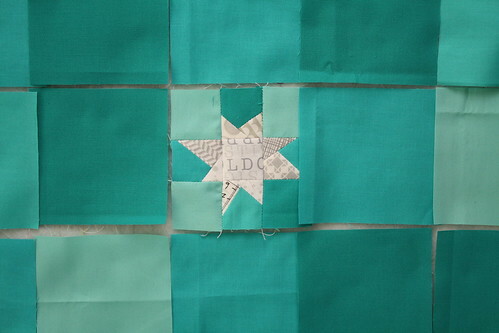 I think our tastes are quite different, and that's part of why I've been so unsure what to sew for her that she'd appreciate, but I finally got a great idea last week - to make her a Lucky Stars mini quilt, in the colors and fabrics that she would love. They might not be the fabrics I would pick to make one for myself, but to each his own, right? I'm really liking how this is coming together, and I hope she's going to love it too! In other news, I'm being featured over at Gable House & Co today, for a fun interview - pop on over to check it out! Happy Friday, I hope you have a great weekend! I've been fooling with this little guy the last couple of nights after the kiddo heads off to bed, when I'm too tired to pack another box, and trying to slow my mile-a-minute brain for the day. My minion started out too tall, and kind of odd, so I've shortened him up, changed the straps of his overalls, and I think he's looking awfully cute now. 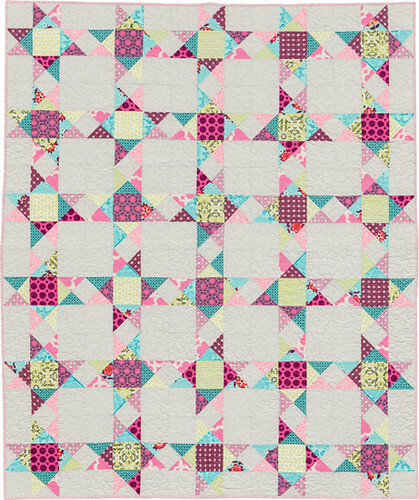 If my fabric wasn't packed up in a zillion bins and boxes, I'd totally be cutting into some fabric right now to start on this, because a simple patchwork project sounds amazingly fun right now. As if I need another work-in-progress! Then again, my local MQG's Sew Day is tomorrow at Inspire, so maybe I'll find some new fabrics for this project and get started anyway. I hope you have a great weekend! The taller stack is a stack of aqua and teal solids from my stash, some Kona, Art Gallery, Michael Miller, and Bella solids. The smaller stack is various low volume prints, in larger squares and then also in smaller squares. I had an idea for the Negative Space Challenge that my local chapter of the Modern Quilt Guild is working on finishing up this month, cut the fabric out, then put it somewhere strange and never saw it again until now. I suppose it's good timing, since it's a smaller project, and having a little something I can work on sewing in between packing duty is nice. 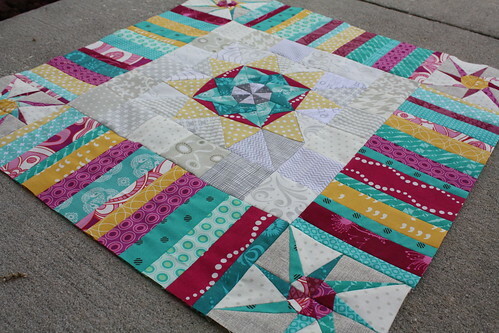 I'm really digging these stars, and the way they're coming together. I love the pixelated background and the depth it gives the negative space, I think it makes the negative space almost sparkle. And all of these aquas and teals together just make me happy. Such a calming, soothing group of colors, don't you think?